"Escape From Bizarro World: Chapter One"
Ma and Pa awaken from a sound sleep at 4:32 and head downstairs, only to find Bizarro in their living room. Bizarro grabs Pa. The next day, Superman stands in the living room as Ma tells him that Bizarro threw Pa into a spaceship and took him away. Superman reassures her, telling her that Bizarro isn't out to hurt people, though he admits Bizarro has killed before. Ma tells Clark that it muttered "Blue Sun." At the Fortress, Superman uses a crystal to contact the spirit of Jor-El, who leads him to the closest Blue sun to Earth. Superman gets in his spaceship and flies to Bizarro World, which is a square planet under a blue sun. He finds the ruins of a faux Metropolis, where the denizens, like Zombies, flood out to grab him, attacking each other along the way. Lois slaps him. "Clark" appears. Superman burns off his secret identity, revealing Bizarro, and demands to know where his father is. Bizarro, enraged at having lost his secret identity, attacks Superman. His people, not understanding his secret identity, attack. Bizarro blasts them with heat breath. Police arrive as Bizarro confronts Superman, and Bizarro burns them with heat breath. Superman tries to stop him. Bizarro hits him with ice vision. As he does, Bizarro clones spring out of Superman, taking him to the peak of a mountain and wrapping his face with their cape, suffocating him. Clark recalls being young, and learning about his powers (he seems about seven), watching Ben Hubbard chase pigs from miles away. In a fake Fortress, Bizarro lays the unconscious Superman before his "viewscreen," where Pa Kent is put in the place of Jor-El, looming above Bizarro, who treats him as a father, saying he needs help to destroy (save) Bizarro World. Story - 4: When I first read this, before the "review" read, I felt like something was off, and wrong. I figured out what that is, and thus knocking one point. Not even because it's that big a deal, but mostly because Geoff's bar is higher than most for me. It's like watching Clerks and then watching Jersey Girl. Can you say that Jersey Girl isn't a better family movie? No. But is it on Clerks level? Double no. So what do you rate it? Geoff writes amazing stories, so I'm harsher on him, I hold him to a higher bar. This is a great story for most anyone, but I have to take a point for Goeff's slight mismanagement of character. 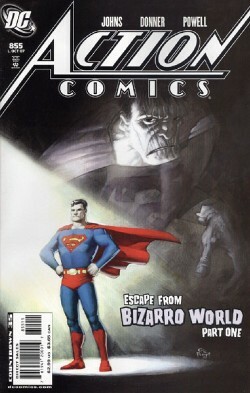 The Bizarro World is excellent, as is all the humor, the setup, the plot. I love seeing Bizarro in action and his strange, pathetic world. I'm glad it's back in the DCU. I'm glad there's continuity, and they don't gloss over the fact that he's killed before. I'm glad that Superman takes a rocketship instead of, Silver Age style, flying through space. I'm not so hot on Superman having powers as a young boy. Like, at all. But if it's gonna be done, I want beautiful character moments like the one toward the end of this book. The stake of Pa Kent is high. I dig it. The only thing that pulled me sideways is the fact that yeah, though the Bizarros are a bunch of crazy, murdering zombie thugs, Superman shouldn't have revealed Bizarro's secret identity. It's Prime Directive stuff, and geeky, I know, but because of Superman's actions, Bizarro KILLED people, and it just lacked the foresight and practical understanding I know that Superman has. I didn't like it. But beyond that, a great start to what I'm sure will be a great series, based in track record. Art - 5: As I expected, beautiful art from Powell. I'm really getting into the Goon, which I just started reading in trades, and it continues well here. I like his Superman, his Bizarro, and the simple humanity he brings to his world. I look forward to the rest of this with great anticipation after this read. Cover Art - 3: Eh. Doesn't really grab me that much, and I'm not sure why. It could be the stock post, the fact that it's kind of weird in angle and intent, and that Bizarro's just kind of sitting there. The words on the cover, I dunno. Not as great as the insides.